This summer FirstBoat.com is preparing to celebrate its 10th year as your online source for boating information. For the record, 1stBoat.com was started this month in 1999, and in October of that year the domain FirstBoat.com was launched with just a few pages but with a framework not all that different than what you see today. The original concept was to create a resource for new boaters to find everything they need to get into boating; but based on the amount of traffic we get, it's clear that not just new boaters have enjoyed our site. 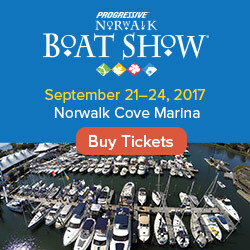 Over the years we've launched features such as the boat name machine, and several other boating blogs and sites including DailyBoater.com, WiFiMarine, and Custom Boat Names, to name a few. As we continue our 10 year celebration this year, look for us to expand on these efforts as well as our social networking endeavors, with the goal of continuing to bring you the information you need to enjoy the boating life. Thank you for visiting and for helping us grow! If you've got a dad who loves to boat, Father's Day shopping is going to be easy for you this year. 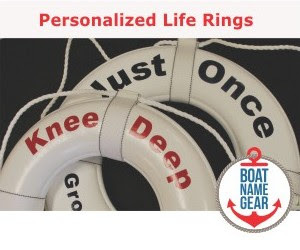 Simply visit BoatNameGear.com and type in your dad's boat name, and they'll stitch it on your choice of a polo shirt or baseball hat, or even a welcome mat for the boat. But that's not all they sell. They also have towels, life rings, visors, and much, much more. In fact, there are so many great gifts to choose from at Boat Name Gear, the hardest part will probably be choosing which ones to get for Father's Day, and which to save as a gift for his birthday.